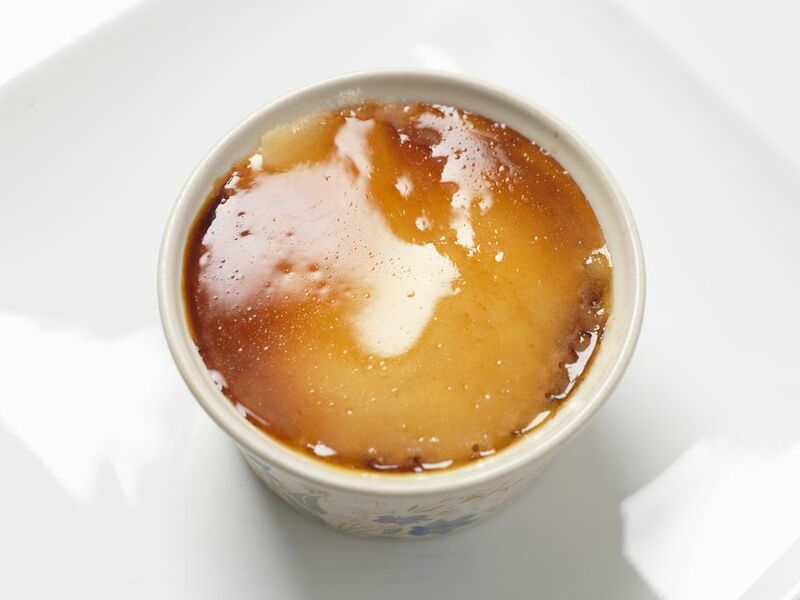 A soft, silky creme cooked to just past setting point and topped with a crunchy, glass-like topping is what makes a classic Creme Brulee one the most loved of all French desserts. The Creme can be found in most European countries, and other continents, which is no surprise, it is one of the best. Coffee and its culinary partner, cream, meld together smoothly in this cafe au lait creme brulee recipe. This creme is not overly sweet and is the classic after-dinner flavor pairing, but be aware, this one is for adults only, children will find it too bitter and most, of course, will not be drinking coffee (hopefully). A classic French brulèe is made in a shallow dish, but over time the method of making in a ramekin had grown in popularity. If you do make this in a shallow dish, reduce the cooking time by at least 15 minutes. Arrange 6 custard cups in a large pan with sides at least 1 1/2 inches deep (see note above about shallow or deep cooking). Whisk the egg yolks in a large bowl until they turn frothy and bright yellow. Slowly whisk 1/2 cup sugar, the creams, and espresso into the beaten eggs. Beat the mixture for 90 seconds at least. Pour the eggs and cream through a medium-mesh sieve into a large (4 cup) liquid measuring cup. Divide the mixture between the 6 custard cups. Fill the large pan holding your cups with boiling water half-way up the sides of the ramekins to create a Bain-Marie or water bath for the cooking. Creating this bath around the cremes stops them from curdling during cooking. If you are lucky enough to have a steam oven, use that instead. Bake the custard in the hot-water bath for 55 minutes to 1 hour, until the custard is set but still moves a bit in the center when jiggled. Cool the custard in the water bath for 20 minutes, and then refrigerate them until they are chilled. Sprinkle the remaining 1/4 cup granulated sugar over tops of the custards and caramelize the sugar with a small, handheld kitchen torch. Serve immediately. Ring the changes by switching the added flavors of your creme. Alternatively, you can use a splash of Grand Marnier or other liqueurs in the classic creme brulée (not for children, though). Rather than using lemon or orange try the flavored drinks to create the changes. Again, perhaps not one for children but great as dessert is choosing a decadent splash of Lavender or adding extra vanilla.